Remember the guy from last year’s holiday party that got so drunk he threw up all over himself – and everyone around him? Or the gal who showed up so scantily dressed you did a double take (for all the wrong reasons) when she walked in the room? Of course you do! And so does everyone else. Holiday Office Parties are Back! Once thought gone for good, the office holiday party is back! And make no mistake about it; these parties are not really parties. They are business events masquerading as parties. We’ve all heard and/or seen people commit career suicide due to their inappropriate behavior at these events. Sure, these parties are a chance to hang out with business colleagues, usually in a fun and informal setting. Do not be lured into the false pretense that you are hanging out with your friends – no matter how good the music, the booze or the food. Below is a list of do’s and don’ts for your company’s holiday party to avoid politically shooting yourself in the foot while spreading good cheer! 1. GO! Don’t even think about blowing this party off. Love em or hate em, it will serve you well to be seen at them. Even if this party is touted as being optional – that doesn’t really mean it is. Your absence may very well be noticed. Worse – it may be prone to misinterpretation (he/she is not a team player, is aloof, is a snob, etc.). Look at this as an opportunity to socialize with people you work with day in and day out – but don’t really get a chance to interact with outside of office hours. You might be surprised to discover how much you actually enjoy your colleagues company outside the constraints of the corporate environment. 2. Network. It’s not good enough to just show up. Since you’re already there - you might as well make the most of it. This is a great opportunity to network with the movers and shakers of your company (i.e., upper management and executives) whom you would normally not have access to. If you’ve never met them before, make it your business to introduce yourself with a brief introduction and non-work related conversation. If you already know these key players, take this as an opportunity to develop a somewhat more personal connection with them. Talk about appropriate personal information. For example, talk about your favorite sport team or clothing designer; ask about their hobbies, etc. Before leaving the party, try to do your best to make sure you had at least a brief conversation with all the key players who were in attendance. You took the time to go – you might as well get credit for it! 3. Dress Appropriately. The office holiday party is not the time to come slinking in with a way too high mini-skirt or stained T-shirt. Rule of thumb: the venue dictates the dress code. If you are in doubt as to how formal or casual the party will be, ask someone whom you believe will know. Every office has that someone who seems to know this stuff! 4. Moderation is the word of the evening! All behavior in moderation. Yes, you are at a party. I’m not trying to be a fuddy duddy or repetitive, but as I said earlier - this party is really a business event. Don’t be seduced into believing you are out partying with your friends, no matter how good the booze, food or music is! Keeping that in mind - eat, drink and talk in moderation. You don’t want to be speaking with meatball sauce dripping down your chin. And there is nothing funny about being drunk – period. Try to avoid speaking too much about anything – especially yourself! Nobody wants to hear about how awesome & brilliant your kids are. They really don’t! Absolutely no offensive jokes or inappropriate comments – this includes gossip. Enough said. Avoid conversational landmines – and you know all the usual suspects: i.e., politics, religion, etc. Whether you love or hate these parties, it’s a smart career move to go and make the most of them. All success begins with relationships. 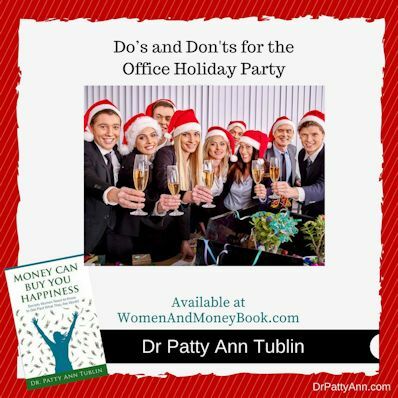 Use the office holiday party as a way to develop deeper relationships with your colleagues. Besides having fun, you might be surprised as to how much it gives your career a boost!